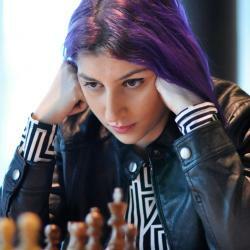 Tatev Abrahamyan is an Armenian born American Woman Grandmaster. She is well known for her fighting spirit as well as her purple coloured hair. She was rewarded with the Goddess Chess Award for her uncompromising play. In 2001, she moved from Armenia to the United States and still maintains strong ties with her chess centric native country of Armenia. She also expressed that her favourite players include Levon Aronian of Armenia and Fabiano Caurana of the USA. Tatev tied for 1st at the US National Women’s Championship in 2004 and 2011 but finished 2nd on tiebreak as she lost the rapid playoffs on both occasions. She won gold the Pan-American Under 18 Girls Championships in 2006, following which she has been a part of the USA National Women’s team since 2008 and has played in all Olympiads since. She achieved the Woman Grandmaster title in 2011 and also graduated, double majoring in psychology and political science in 2011.